Pope Francis Christians and Muslims are brothers and sisters, he said in an address at the central Koudoukou mosque in the PK5 district on the most dangerous part of his 24-hour visit to the war-torn nation. He urged Christians and Muslims to reject hatred and violence on a visit to a mosque in a flashpoint Muslim neighbourhood of the Central African Republic's capital Bangui. The US secret service said on Friday a man who jumped White House fence while draped in an American flag on Thanksgiving had been charged with unlawful entry. The intrusion prompted both a lockdown of the White House as the first family celebrated Thanksgiving and new embarrassment for the secret service amidst heightened security levels in the aftermath of the Paris terror attacks. Fart and stop a plane!! Here is one sure fire way to stop an aeroplane. Just Fart! No... One fart isn't enough. All the passengers should fart in unison. They say dog biting man is no news. But, man biting dog is definitely a news. 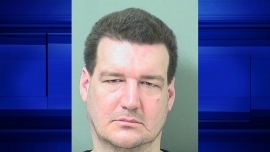 A Florida man bit the dog so badly and choked it so fard that its eyes simply popped out.